NASA's Terra satellite flew over Typhoon Nida shortly after it made landfall just north of Hong Kong. On Aug. 1 at 11p.m. EDT (Aug. 2 3 a.m. UTC) the Joint Typhoon Warning Center issued its final bulletin on Typhoon Nida. By that time, Nida had already made landfall and was located about 49 nautical miles northwest of Hong Kong, near 22.8 degrees north latitude and 113.5 degrees east longitude. Nida was moving to the west-northwest. Maximum sustained winds were near 74.8 mph (65 knots/120.4 kph) making it a Category 1 hurricane on the Saffir-Simpson Wind Scale. At 11:05 p.m. EDT (Aug. 2 at 3:05 a.m. UTC) the Moderate Resolution Imaging Spectroradiometer aboard NASA's Terra satellite captured a visible image of Typhoon Nida after it made landfall near Hong Kong, China. The image showed the center of Nida north of Hong Kong, and the eye had become cloud-filled. A strong band of thunderstorms extended to the southwest of the center to Hainan Island. 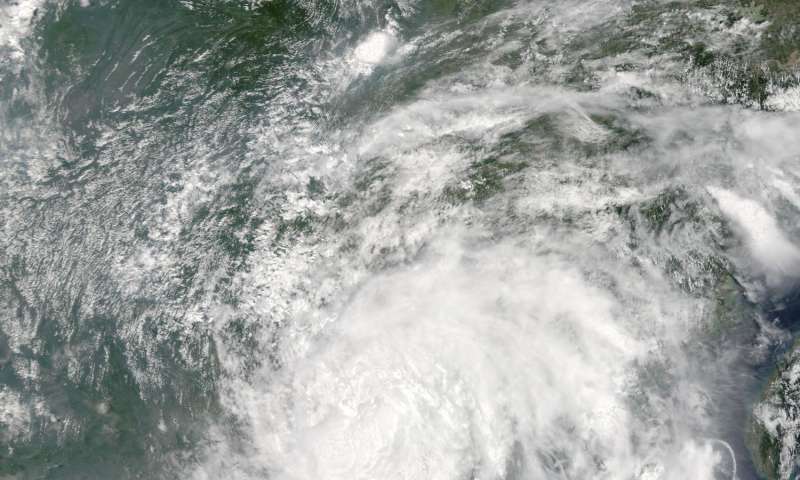 By 4 p.m. Hong Kong local time on Aug. 2, Nida had weakened to a tropical storm. Nida was located 149 miles (240 km) northwest of Hong Kong and forecast to move to the northwest. Hong Kong Observatory will cancel warnings later today, but advises residents to stay away from the shoreline. To hear the forecast from Aug. 2, 2016, visit: http://www.hko.gov.hk/wxinfo/currwx/briefing/report_e.mp3?20160802121504. Nida made landfall near Hong Kong and no major damage was reported in the city. The Hong Kong Observatory reported that some areas of the city noted reports of winds of up to 90 mph (145 kph). The storm is moving to inland areas of Guangdong and further inland where it is expected to dissipate.